FIVE MINUTES. THAT'S ALL IT TAKES TO SAFELY FLUSH OUT ENGINE-DESTROYING SLUDGE, DEPOSITS AND CONTAMINANTS THAT ROB YOUR ENGINE OF POWER AND EFFICIENCY. 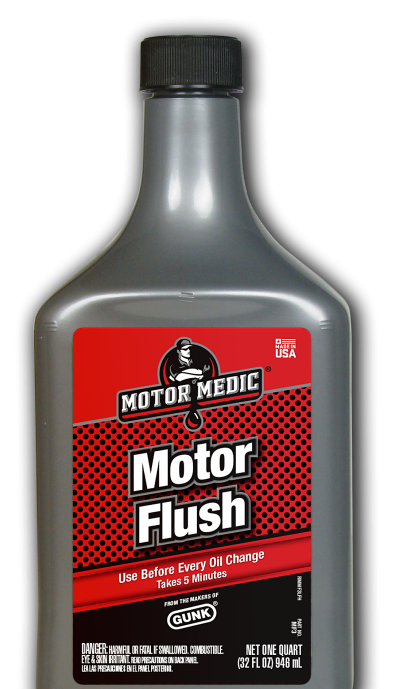 MOTOR MEDIC MOTOR FLUSH HELPS RESTORE YOUR VEHICLE'S LOST PERFORMANCE AND EXTEND YOUR ENGINE'S LIFE. USE IT BEFORE EVERY OIL CHANGE. With the engine turned off, check to see that the oil level is within specification. Add the entire bottle of Motor Flush to your cold engine before changing oil or oil filter. Engines with oil capacities of 10 quarts or more may require a second bottle of Motor Flush. Turn on the engine and idle for 5 minutes, DO NOT rev the engine or drive the vehicle. 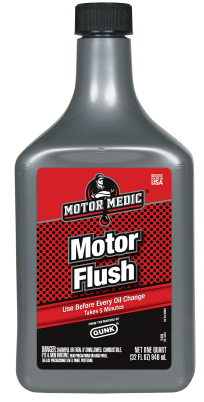 Motor Flush will clean out dirt, sludge, and contaminants from your engine. 5 minutes is all you need for an effective cleaning. With the engine turned off, drain the engine oil. Give the oil a few additional minutes to fully drain from the engine. Add new oil and replace the oil filter as part of a full service. 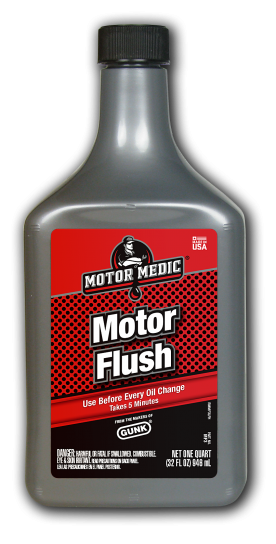 Use MOTOR MEDIC Motor Flush with every oil change to keep your engine running cleaner and longer. Q: What is Motor Flush? A: Motor Flush is a proprietary blend of solvents and detergents in a petroleum carrier fluid that delivers optimal cleaning power to your engine’s internal parts. Q: Is it safe for my engine? A: The chemicals in Motor Flush are completely safe for all engines, as long as the application / use time does not exceed the specified time period of 5 minutes and other use directions are followed. It is designed to offer optimal cleaning while preserving lubricity of the oil to prevent wear during cleaning. Q: Why do I need Motor Flush? A: Motor Flush is needed to clean out the built up dirt, deposits, and contaminants that can accumulate even with steady oil changes; periodic cleaning will extend the life of your engine. Cleaning will remove sludge that can block oil flow and cause engine damage. Q: My high end synthetic oil has all of the cleaning and detergent additives I’ll ever need, why do I still need Motor Flush? A: While high end synthetic oils do a much better job of cleaning the engine over conventional oils, there are many factors that exist such as driving conditions, short trips, severe duty, weather extremes, mechanical abuse, and lack of maintenance intervals which can break down even the most robust synthetic oils, Motor Flush is the final stand in overall engine cleaning. Q: Can I drive with Motor Flush in my engine? A: No. Motor Flush is only to be used right before an oil change with the engine at idle. Never drive a vehicle until the old oil with Motor Flush is fully drained and new oil is added. Q: Can I leave it in over 5 minutes? A: No. Due to the strength and effectiveness of the formula, longer application times (exceeding 5 minutes) could lead to engine damage. Q: Is it safe for diesel engines? A: Yes. 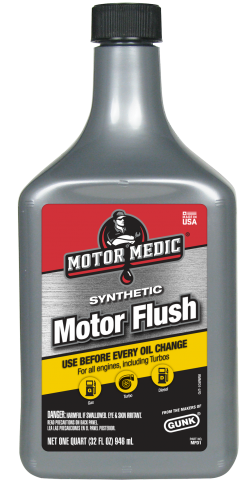 While MF3 is safe for diesel engines, we recommend using MOTOR MEDIC Synthetic Motor Flush (MFD1) for diesel applications. MFD1 contains friction modifiers and extreme pressure and anti-wear additives designed to offer increased protection to all diesel engines and gasoline engines with oil-cooled turbochargers. Q: What is the difference between Motor Flush and Synthetic Motor Flush? A: Synthetic Motor Flush contains added extreme pressure and anti-wear additives that provide added lubrication as the engine is being cleaned. Leftover additives will provide an extra layer of protection to the engine as new oil is circulating. Synthetic Motor Flush is recommended for all diesel and turbocharged engines. Q: Can I add this to any other system in my vehicle? A: No. Motor Flush is designed only for your engine’s oil system, it cannot be used in any other system. Add it only to the crankcase immediately preceding an oil change. Always follow label directions to give optimum cleanings. Q: How much Motor Flush do I need to add to my engine? A: Motor Flush is most effective when used with up to 6-7 quarts of oil in the crankcase. Engines with higher oil fill capacities may require an additional treatment size for desired results. Q: Is Motor Flush safe with any type of engine oil? A: Yes. 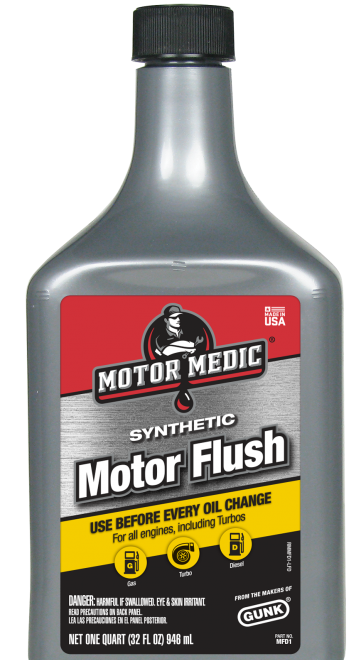 Motor Flush will work with all conventional, synthetic blend, and full synthetic engine oils. Q: What sets Motor Flush apart from products such as Seafoam® and Marvel Mystery Oil®? Q: Does Motor Flush work well with high mileage engines? A: Yes. Motor Flush works well with higher mileage engines that may have added sludge and varnish deposits. Extra care may be needed for high mileage engines with excessive sludge and contaminants. Always follow label directions to give optimum cleanings. Q: Can I use Motor Flush on my motorcycle? A: We do not recommend Motor Flush for use in motorcycles that share fluid between the primary (transmission, clutch pack) and the engine oil. * Seafoam® is a registered trademark of Seafoam® Sales Company. Marvel Mystery Oil® is a registered trademark of Turtle Wax®.